Cornell University history professor Barry Strauss discusses his new book about leadership lessons from the Roman Empire. The Roman Empire has fascinated history buffs for centuries with its stories of political ambition, military victories and corruption. But the Romans were also known for their efficiency, feats of engineering and deft management of far-flung communities. Today’s business leaders can learn valuable lessons by looking at how they built and ran a vast empire. 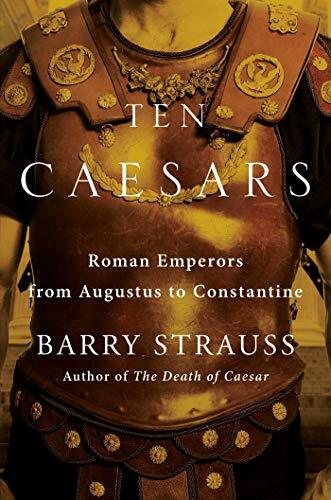 Cornell University professor Barry Strauss uncovers those lessons in his book, Ten Caesars: Roman Emperors from Augustus to Constantine, and joined the Knowledge@Wharton show on Sirius XM to discuss them. Knowledge@Wharton: Tell us why you put together a collection of stories of these 10 Roman emperors and their legacies. Barry Strauss: Caesar was a family name originally, like Julius Caesar, but it became the generic name for what we call an emperor. They didn’t call themselves emperors. They called themselves Caesars or Augustus. They all wanted to claim a family relationship with the founders of the dynasty, with Julius Caesar and Augustus, even though in most cases they were not related to them. Sometimes they were adopted. Sometimes they just grabbed power, but they liked to think they were all part of the same family. So, that’s why we call them Caesars. What makes them so fascinating is they ran this empire of 50 million to 70 million people that stretched over 3,000 miles with very primitive technology, hugely diverse in terms of its ethnicities and cultures, and they kept it together and they coped with change. They’re a model of how leaders can deal with change and save what they think is important about the past while adapting to the future. Just the amazing pragmatism and ruthless adaptability of these leaders is what really drew me to them. Knowledge@Wharton: What is it about these leaders that still resonates today? Strauss: For one thing, they are founders. [Facebook CEO] Mark Zuckerberg is really fascinated with Augustus because Augustus was a founder of something great, an empire that lasted for centuries. He had an enormous vision of what this empire could do, and he was tremendously successful in bringing peace and prosperity to the empire. Another thing that resonates about these leaders is their ability to plan for the succession. It didn’t always succeed. Augustus was in power for decades, but very early on he was concerned, “Who’s going to replace me? Who’s going to come next?” He paid a great deal of attention to the very difficult process of getting the right person who would replace him. Another thing about these leaders is that they’re amazingly efficient. If you think how big the empire was, it was kind of amazing that they ran it with an army of only 300,000 men. That’s a lesson in efficiency there as well. Knowledge@Wharton: It’s interesting that, as the Roman empire continued to develop and claim other territories, they offered citizenship to the people they had just conquered. Strauss: That’s one of the reasons why the Romans were so successful. From their early years on, they didn’t just conquer people, but they befriended them by offering them citizenship. It’s a slow process, it takes centuries, but ultimately all the free people in the Roman empire become Roman citizens. This is one of the most progressive moments in history. That they should extend their citizenship in such a way is a lesson for us today. Knowledge@Wharton: I read that a favorite of yours was Marcus Aurelius. Why? Strauss: He’s really the one emperor who’s a truly good human being. Most of the emperors, not so great, but Marcus Aurelius is a good person. He was a philosopher and left us his Meditations, this really amazing book. It’s so rare in history that we can see inside the mind of a leader and that a leader speaks to us in such an elevated manner. He still offers us business lessons and leadership lessons and life lessons for today. Knowledge@Wharton: You start the book talking about Augustus as an icon who knew how to win at everything. Can you tell us about him? Strauss: He was born Gaius Octavius and was adopted by Julius Caesar, and he changes his name to Julius Caesar. We sometimes call him Octavian because of his birth name. But he takes this name Augustus, which means something like “reverend” or “respected one.” So, he is an icon. … He’s also just immensely talented. He is a great speaker and a very wily politician from an early age. He emerges on the scene at 18. He’s not the world’s greatest general, but he is good with people. And he gets himself a superb general, Marcus Agrippa, to fight his battles for him, to be loyal to him. It’s someone he can trust. It’s his intelligence and Augustus’ skill at people relations that gets him the second-in-command that he needs, which is so important for any leader to have a trustworthy, efficient, competent second-in-command. Knowledge@Wharton: How do you qualify him as a leader? I would imagine he had to have qualities similar to a CEO. Strauss: Definitely. He’s got to run this huge empire, so he’s got to have the right people to help him and people he trusts. He’s also got to have an intelligence network and a work ethic that’s just punishing. The guy is on the road for years and years and years. It’s not as if he’s sitting in the palace in Rome, but he’s constantly traveling, constantly showing himself and constantly marketing himself. His image and that of his family are ubiquitous in the Roman world. You see them everywhere, on coins, in statues. Again and again, the guy’s making the decisions — exactly like running any large enterprise. Any image that we might have of the emperors just being decadent and having people feed them grapes is not going to apply to Augustus. Knowledge@Wharton: When you look at this time period, the story extends far beyond the seat of power in Rome, correct? Strauss: Ultimately, the empire extended from Britain to what is today northern Iraq and including Egypt and North Africa, the western part of Germany and all of the Mediterranean. The Romans are very good at making deals with people, by extending their citizenship but also offering the highest levels of power to people from the empire. The emperors eventually don’t come from Rome and they don’t come from Italy. They come from Spain, they come from North Africa, they come from Syria, they come from the Balkans. The fact that the Romans were willing to open their elite to newcomers from so many different places is, I think, a key reason for their success. Knowledge@Wharton: What about the role of women during this time? Strauss: It’s easy to overlook them because the Romans were macho and sometimes misogynistic. But the women played a huge role in Roman society at every level, from trade and craftsmanship, but also in the imperial family. Augustus married a Roman noblewoman named Livia, and they were married for 54 years. She had an enormous amount of influence. She was not just his wife, she was one of his chief advisers. She traveled with him around the empire, so she was not staying at home. She built buildings. She organized religious festivals. She particularly reached out to women. And she was not unusual. Many of the emperors had influential wives, mistresses, mothers. Hadrian was the first emperor in history, maybe the first man in history, to deify his mother-in-law. He made her into a goddess. Constantine’s mother, Helena, later Saint Helena, was one of the key figures in the Christianization of the Roman Empire. He gave her the task of turning Palestine into the Holy Land. Women were playing a very, very important role. Knowledge@Wharton: One of the chapters is titled “Hadrian, the Greek,” which gives us opportunity to talk about the dynamic between the Romans and the Greeks in that period. Strauss: What we call the Roman Empire could also be called the Greco-Roman Empire. The Greek people were everywhere in the empire. The Roman elite learned Greek the way maybe the British and American elite used to learn French. Rome had a huge Greek population, probably the largest Greek-speaking city in the world in the time of Imperial Rome. If you think about the cultural legacy of Rome, what are the two most influential books from the Roman Empire? First, the New Testament written in Greek, then Marcus Aurelius’ Meditations, also written in Greek. Neither of them written in Latin, but they’re both products of the Roman Empire. Knowledge@Wharton: Nero is in the book. He’s not your favorite. Strauss: Nero was not a good person. He is responsible for the murder of his own mother and the death of his first wife, whom he divorced for another woman. He presided over the great fire of Rome, and there was some evidence that he might even have caused the fire because he wanted to build a new city, which he wanted to name after himself. He wanted to change the name of Rome to Neropolis. He was also a persecutor of Christians and responsible for the oppressive government of Judea that led to the Jewish revolt against Rome. He was a bad actor. Knowledge@Wharton: There are also some figures in the book that people may not be familiar with. One of them is Emperor Septimius Severus. Who is he? Strauss: He came from what is today Libya and was partly descended from Italian colonists. It’s possible that he was also partly descended from North Africans, from Berbers. It’s conceivable that people might think of him as the first black emperor, although we honestly don’t know about his race. What’s interesting about Septimius Severus is that he made the empire much more militarized than it had been before. He came to power in a civil war and created a new legion base right outside of Rome on the Appian Way. His motto was, “Pay the soldiers and forget about everybody else.” Talk about a CEO who’s ruthless about identifying the one part of his workforce that matters. It’s also interesting that he married a woman from Syria, so he created this new dynasty from Syria and North Africa that certainly was changing the ethnic and cultural composition of the ruling family in a big way. Knowledge@Wharton: The Roman Empire used its military as an important tool for expansion. As time goes on, other countries were developing their military strength, which contributed to the demise of the Roman Empire. Can you talk about that? Strauss: One of the things about successful military power is it generates imitators and competitors. That’s true in business as well. The Germans, who fought the Romans on and off for centuries, also learned organization and discipline from the Romans, which allowed them to defeat Augustus’ attempt to conquer all of Germany. They destroyed three Roman legions and ultimately conquered the Roman Empire. Meanwhile in the east, the Romans had been fighting for centuries with an Iranian empire called the Parthians. The Parthians collapse, in part because of the pressure from Rome. That’s the good news for Rome. The bad news for Rome is they were replaced by a new dynasty that was even stronger and more of a challenge to Rome — the Sasanian Persian empire. So, for centuries the Roman Empire was fighting wars on two fronts: in the west against Germans, and in the east against Iranians. Knowledge@Wharton: Can you talk about the end of the empire, when there were multiple rulers? Strauss: The Romans came to the conclusion that the problems of the empire were too big for any one person. Beginning with Diocletian and most of his successors, the empire was divided between two emperors, one in the east and one in the west. There was too much pressure on the frontiers for any one person in any one place to deal with it. Knowledge@Wharton: What were some of the factors that pushed the empire towards its end? Strauss: Misgovernment was a big factor. In the west, the empire had a series of bad emperors and dynastic disputes, internal conflict when the Romans could ill afford it. When they most needed to be unified against outside pressure, they gave themselves the luxury of fighting each other. Another problem was that there was pressure on the frontier. Coming from the east, there were new peoples who were pushing the Germans out of Germany and into the Roman Empire. The Romans had to deal with this issue of massive immigration and the challenge that it presented, and they didn’t handle it very well. Knowledge@Wharton: Even with the power the Roman Empire had, they were trying to find peace for a large section of the world, right? Strauss: Absolutely. Beginning with Augustus, the Romans prided themselves on their ability to provide peace, order, good government and a degree of prosperity. Now, how to do all that while also dealing in many periods with huge military challenges? It was a very tough job. Knowledge@Wharton: The emperors also had public relation wars. Can you explain that? Strauss: The emperors were great marketers. One fabulous example of this is the Coliseum. We think of the Coliseum in Rome as a sports arena, but it wasn’t just about sports. It was about selling the empire, entertaining the people of the City of Rome and keeping them happy with these games, but also giving people a sense of the greatness and power and glory of the empire that could build anything like this. They brought human and animal victims from all over the Roman world. So, it’s a way of marketing Rome. Knowledge@Wharton: I do find it interesting that there was a continuous succession of leaders over 400 years, yet the strength of the empire stayed intact during all those transitions of power. Strauss: The Romans had already developed habits. By the beginning of the empire, they’d already been in the business of expanding for centuries. They developed these habits of pragmatism and ruthlessness, and I think that’s one of the reasons why they are able to hold the empire together. They also had the structure of Roman law and engineering skills — the roads, the transport system, the buildings — and the ability to bring in outsiders and make them citizens, to give them a stake in maintaining the Roman Empire. It’s all part of a package. Knowledge@Wharton: Why do people continue to have such a fascination with these emperors? Strauss: We can constantly learn from them. Of course, some of the things that we learned from them are negative. But there are positive lessons that we can learn from them about how you rule, how you deal with change, how you deal with complex and diverse societies. And indeed, how you get to be great. Empathy is increasingly a valuable skill for chief strategy officers, notes the author of this opinion piece.